UPDATE: 03/06/2014 - Selected UK etailers now have Devils Canyon CPUs up for preorder. Overclockers.co.uk lists them as available from the 23rd June, Scan.co.uk from the 30th; others will probably have their own shipment dates listed before the end of the week. 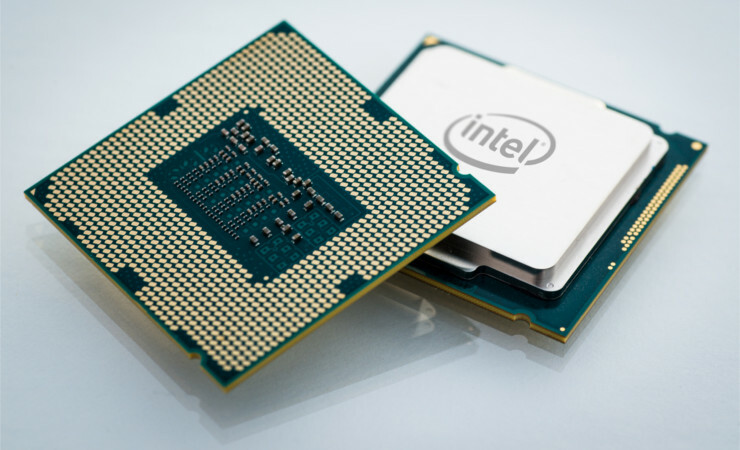 At GDC last March Intel took the time to outline their 2014 plans for the desktop market segment, noting its strong growth over much of 2013 and the deepening product range available to consumers thanks to ever more power efficient solutions. We knew the 9-series motherboards would be arriving in May, coinciding with a refresh of the Haswell CPU lineup that bumped clock speeds, to spike interest prior to Computex. What we knew less of is Devils Canyon – the unlocked K-series CPU range which is part of the Haswell refresh. Today at Computex in Taipei Intel are officially taking the wraps off Devils Canyon and presenting it to the world. Rather than a full rehash of Intel's keynote, lets briefly go over some of the more salient points. In Q1 2014 the desktop market continued to grow, diversifying further into novel solutions such as All-In-One and small form factor designs. Notably desktop has been growing in both commercial and consumer sectors, not least of which due to the wider range and capability of PCs now available. The rotation from support of Windows XP has also helped to stimulate demand, doing what Windows 8 seemingly wasn't able to accomplish alone. The platform is nothing without software, and Intel are enabling the next generation of 'Multi-User, Multi Touch' applications through hardware enhancements. Latest apps. to be revealed are Hasbro's RISK, The Game Of Life and Scrabble, bringing the world of family table-top gaming to the still nascent AIO platform. Not only that, Intel are also driving down prices in mobile and stationary AIO desktops thanks to the new Baytrail-D SoC, which reduces overall cost thanks to reductions in heat output and power requirements. Retail pricing for portable AIOs are projected to hit as low as $599 whilst stationary variants could bottom out at $349 by EOY 2014. Large brand partners such as Lenovo, ASUS, GIGABYTE and more are also taking advantage of new technologies by bring to market their own visions of Intel NUC-esq small form factor PCs, including branching out into Chrome OS systems. This confidence is reflected in a 2.5x increase in available designs since 2012. - Enabling Intel 4K AIOs to appear on the market at less than $1K. These will not be cheap and hastily assembled monitors of course. As high quality PLS devices they will support 60Hz at UHD resolutions, 100% sRGB Gamut and be Technicolor certified. Outside of the pure gaming/enthusiast segment therefore Intel have their work cut out for them. However success in these fields should enable further developments in gaming, perhaps with the most visible change being more affordable 4K gaming panels. Only time will tell in this regard. During their representations to the press Intel have been keen to stress the growth of the gaming segment in the discrete desktop market, not only in software sales but also hardware revenues. Citing popular online multiplayer title League of Legends' 27M daily worldwide playerbase, a 168% increase in viewers for the Intel Extreme Masters eSports circuit, and not even mentioning Steam's frequent 7m concurrent user stats, Intel obviously see it as a key market for their products. In that context Devils Canyon was born. Intel engineers were given six months – an extremely challenging timeframe in part due to the Broadwell's release schedule – to design and deliver changes to the Haswell package which would allow an unlocked CPU to hit a 4GHz base clock (up from the 3.5GHz base clock of the Core i7-4770K). From that target the Core i7 4790K was born, a 4-core, 8-thread CPU which operates all four cores at 4GHz and makes use of the 2.0 update to Turbo Boost to push single cores to 4GHz under appropriate load. Pair it with a Z97 motherboard and you have what Intel are calling Devils Canyon, a platform for gamers and overclocking enthusiasts. The Core i7 4770K was re-engineered to include new capacitors and hence far more robust power circuitary, allowing it to sustain such high clocks. Additionally because Intel didn't want to place any additional undue costs onto notoriously price-conscious consumers new thermal interface material was utilised, dubbed Next-Generation Polymer Thermal Interface Material (or NGPTIM). Theoretically therefore the Core i7 4790K is capable of reaching clock speeds in excess of its predecessor when overclocked. To coincide with the release of the Core i7 4790K motherboard manufacturers have held back some members of their Z97 range, many of which will be released in the coming weeks. Now, upon the unveiling of Devils Canyon, Intel are also explicitly stating that Z97 will be compatible with the upcoming 5th generation of Intel Core CPUs on LGA1150. The Core i7 4790K isn't the only Devils Canyon CPU. Replacing the Core i5 4670K is the i5 4690K, a non-hyperthreaded unlocked chip with many of the benefits of its burlier brother but at a lower cost commensurate with its relative performance. Hitting a much more modest 3.5GHz base clock, it may nonetheless be a choice for more cost-conscious enthusiasts and gamers. Much has been made of the potential for overclocking Devils Canyon. Early Z97 overclocking tests indicated that 9-series motherboards didn't typically allow CPUs to push past their previous limitations, but were able to reach the upper bounds of performance at a lower core voltage. This is critical for long-term CPU durability, and bodes well for both unlocked Haswell Refresh CPUs. In theory at least the more robust power circuitry and NGPTIM on Devils Canyon CPUs should allow high watermarks to be set in CPU performance without using exotic cooling methods. The proof of the pudding will be in the eating (or rather the overclocking), but expectations are – if not high – at least positive. Unfortunately we then come to the release date, or lack of one. Intel have been uncharacteristically coy as regards to the shipping date of these CPUs, and not in a way that we would suspect covert NDAs to be operating. A rushed schedule has made deadlines tight, and although they seem assured of June wk 3/4 release they wouldn't be drawn to name a specific date. During today's keynote Intel will hopefully provide us with that answer, but even then stock levels for the CPU may be lower than we're used to for Intel enthusiast chips on launch. 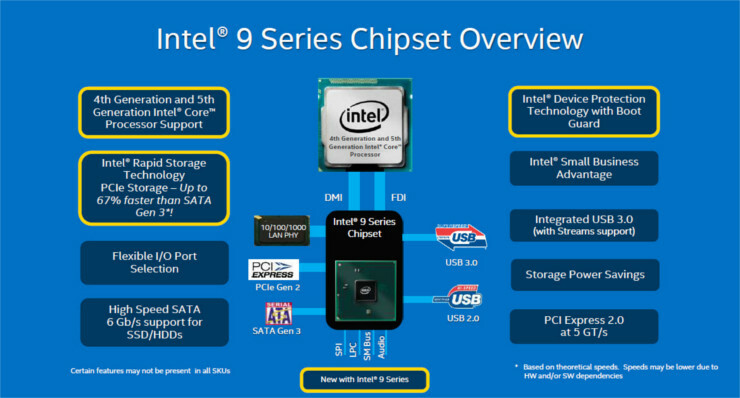 Earlier it was mooted that the new unlocked CPUs will only be compatible with Intel 9-series motherboards. However Intel have since stated that Devils Canyon CPUs will also be compatible with selected Z87 motherboard SKUs, i.e. those able to handle the slightly higher TDP of the new chips following a suitable UEFI BIOS update. Essentially, support is up to the motherboard manufacturers themselves rather than Intel laying down the law. We have been in touch with GIGABYTE who stated that as far as they were concerned all Z87 motherboards would be compatible with the new unlocked CPUs. It's worth noting however that such systems couldn't be classed as 'Devils Canyon' as they do not also include the features new to the 9-series – esp. Intel Rapid Storage PCIe technology. Our most recent communication with ASUS UK indicated that they were still awaiting word from the engineers before committing themselves to a statement. We heard nothing back from other manufacturers we reached out to. Of course, this all has potential ramifications for Z97 sales going forward as well as Broadwell in late 2014/2015, but that's really beyond the scope of this piece. We would however note that given a choice between Z87 and Z97 the latter is really the superior platform; it's probably not worth looking for cheaper Z87 variants except in under-served form factors. It's been some considerable time since Pentium was Intel's performance brand. Still, it's a well respected one and as teased in March Intel are indeed releasing the first unlocked Pentium in years: the Intel G3258. Although not quite the snappiest of SKUs – the Pentium lineup is a more budget-oriented arrangement these days where naming schemes have even less to do with performance - it is a truly budget CPU thanks to clocking in at a cheerful $72 MSRP. In common with others in the range the dual-core, single-threaded CPU G3258 has a modest clock speed of 3.2GHz, but you'll notice that it's the only G3-series CPU to feature an unlocked multiplier. As with other G32 CPUs it only supports DDR3 1333MHz memory, which could be a significant bottle-neck to overall performance even if it didn't seem to hurt those from previous generations. The limitations for the CPU therefore aren't currently known by the press or general public, and could be a nice little clocker for the money. For a certain class of consumer the most noteworthy feature of the G3258 is support for Intel's Quicksync encoding and transcoding. It's therefore ideal for those on a particularly tight budget who want to take advantage of the codec's excellent encoding or transcoding speeds without spending large sums on a full-scale Core i3 PC, also keeping down cooling and noise to boot. Overclocking the G3258, like the K-series CPUs in the Core i5 and i7 range, likely requires a Z87 or Z97 motherboard flashed with an up to date UEFI BIOS. Quick Sync however will be available on all 8-series and 9-series boards. So that's a rundown of today's announcements from Intel. Unfortunately we don't expect any news about the eagerly awaited enthusiast/workstation class Haswell-E platform which had been due in the second half of the year. However we will seek to update this article should any new information come to light.